Flared trousers are a thing I use with extreme caution, for being short and wide hipped. Heels are a must as you want to give them room to flow. Also, the length is very important: they must skim the floor, so just at the line where your heel meets the floor. This one is a bargain from Very and I think I could do with a size smaller, but they I was in doubt then they didn’t have in stock. I think they run slightly on the larger side of cuts, as the 10 was a bit big for me. I paid £17 and I think they are around £20. Would look great with a white shirt, or some crochet top too. I love and off-the-shoulder top because A. I have a tattoo and I like showing it, b. I feel the bit of fabric on my shoulder “cuts” and disguises my wide arms. This one is from H&M, from their Coachella line and cost only £7.99. Great for festivals, will do you justice with the beach with some cropped denim shorts. Now, let’s talk hats. I had a thing for floppy brimmed hats for a very long time. However, all the ones I tried seemed to be super wide brimmed – a bit too much for me, to the point I though I was wearing a sombrero. Ok. Maybe not that wide, but you get the idea. Three years after first wanting one, I meet this at H&M, only £12.99. It has a smaller brim and I feel very comfortable with it. It is amazing for bad hair and rainy days. Trust me. The shoes were bought at New Look, also a bargain, believe around £20. It is super high with a huge platform and chunky heel. The front is also quite wide, which I like, with a retro nod, but modern. I’ve been wearing these sandals A LOT, with trousers, shorts, skirts, dresses… name it. it is also versatile in terms of style, and not only for retro. Finally, the fringed sac bag from New Look, at only £17.99. Very simple, quite roomy and a very easy way to incorporate fringes on to you wardrobe. I added a pendant, a few rings and RayBan Clubmaster sunglasses. Makeup was simple in gold/brown tones with orange lips using MAC Morange. 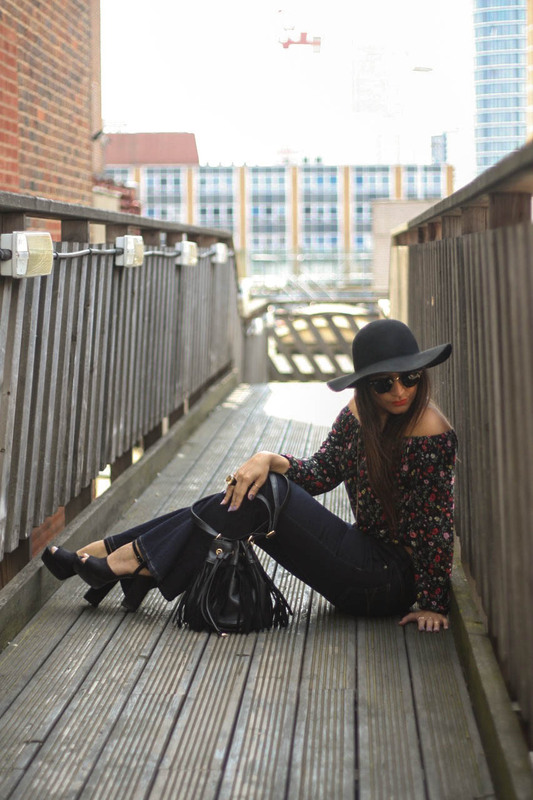 70s has come with lots of interpretations and the hippie girl is only one of them. You can pick from being more bohemian with long floaty floral dresses, cool with metallics and minis and much more as that decade gave us so many in terms of fashion. 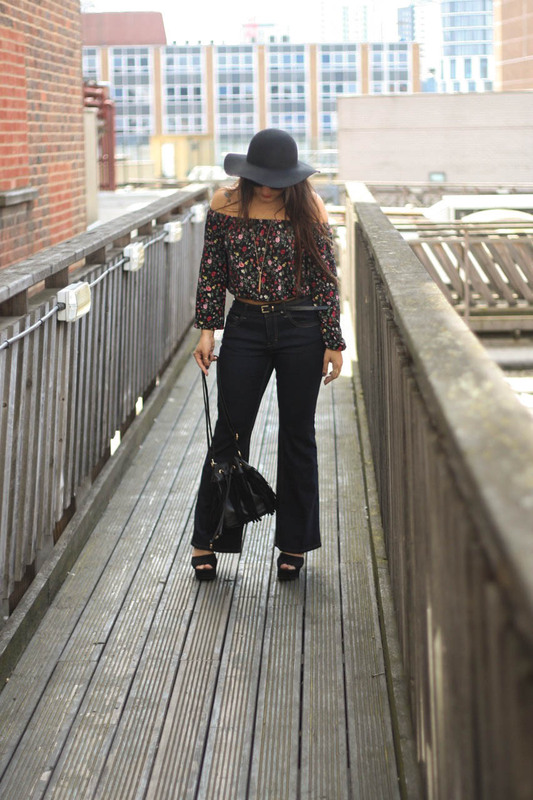 How are you taking the 70s trend into your wardrobe? Or are you shunning it completely? Do let me know. Hey Kelly! Nice to hear from you and thank you so much for the compliments and I am really glad you are enjoying the posts! I am so sorry to hear about your mum. I do hope you and your family keep finding the strength to cope with whatever is thrown your way, whenever it may come. We might not be ready for certain things, but we are certainly strong enough to see it through the pain and sadness and find comfort. And you too – keep doing what you enjoy, even though life keeps sending all sorts your way, you are strong to keep going. Thank you! And Great value too! Although lots of shops have them at the moment, so easy to find at a reasonable price!